The IL Muslim Civic Coalition, which formed last October, claims to be "a partnership of 250+ Activists, Influencers and Organizations. We empower the voices of cultural and diverse Muslims." It issues voter guides and does candidate training. Last month, it was among the groups to meet with Chicago Cubs owner Tom Ricketts after disclosures that Ricketts' father had made anti-Islamic statements. But many Coalition organizers – and even the organization itself – already have demonstrated their own uniform and often radical ideology, especially when it comes to issues involving Israel. 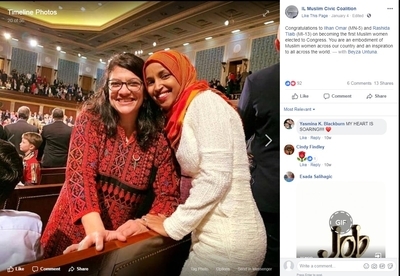 In a January Facebook post, the Coalition praised the anti-Semitic Congresswomen Ilhan Omar and Rashida Tlaib as "an embodiment of Muslim women across our country and an inspiration to all across the world." The next month, the Coalition rallied to defend Omar after she made another anti-Semitic statement. Omar said American support for Israel was "all about the Benjamins, baby" – meaning money. When asked who she was talking about, Omar replied, "AIPAC!" – the pro-Israel lobbying group. The Coalition rushed to Omar's aid in a Feb. 13 Facebook post, trying to erase any interpretation that Jewish money was driving American policy: "AIPAC is a powerful pro-Israel lobby," it said. "This is a fact. And AIPAC is influencing our lawmakers against the long term best interests of America. USA must be an equitable and just leader in the world. We respect and love our Jewish brothers and sisters. But we should NOT support Israel's oppressive policies against Palestinians." The post included an action plan, urging followers to initiate conversations with five neighbors and one local official using its talking points. Like all other American Islamist groups, the Coalition has been unwilling to acknowledge any role Hamas and the Palestinian Authority play in fomenting violence and indoctrinating Palestinians to reject peace with Israel. It has said nothing about a brutal Hamas crackdown on protesters frustrated by deteriorating economic and quality of life issues in Gaza as Hamas prioritizes building its rocket arsenal and digging terror tunnels to attack Israeli civilians. But board members are not shy about going after anyone who strays from their orthodoxy. When it comes to Muslims who advocate a modern reform of their faith, for example, Coalition "Steering Board Member" Aiman Beg is overtly hostile. He shared a Facebook post in 2016 which referred to reformers like Maajid Nawaz, Zuhdi Jasser and Asra Nomani as "charlatans" and "chumps" who "could care less" about Muslims. The post was written by Ahmed Rehab, who runs the Council on American-Islamic Relations (CAIR) Chicago chapter. The previous fall, Beg shared a blatantly anti-Semitic Facebook video. It was touted as a speech comparing Israel to an "ADDICT LIVING OFF THE LOOT FROM AMERICANS TO KEEP THEIR 'OCCUPATION ADDICTION' GOING!" "AIPAC + ROTHSCHILDS JEWISH MAFIA ARE FORCING MIDDLE CLASS AMERICANS TO KEEP FEEDING THE DANGEROUS ADICT [sic]!" the post said. Beg shared and applauded it for offering a "very enlightened perspective." In December, Beg live-streamed a speech by former CNN contributor Marc Lamont Hill, who was fired from the cable news outlet after calling for the destruction of Israel at the United Nations. "Standing up with Dr. Marc Lamont Hill and against the unjust and biased actions of CNN, does not imply our love and care for our Jewish cousins is any less," Beg wrote. "We stand against the injustice and hypocrisy of a #media company pressured by an unjust foreign State and its supporters." 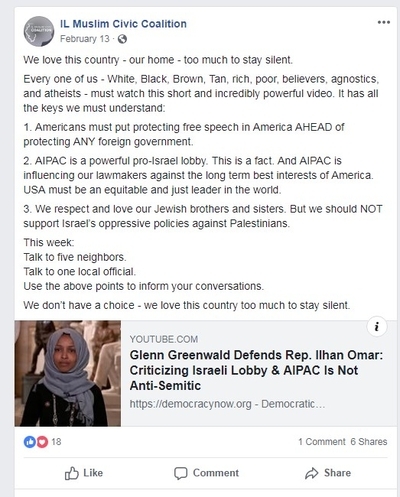 Arshia Ali-Khan, whom the Coalition describes as a "Steering Board Member and Development/Grants Team Member," once shared on Facebook an article from The Intercept that attempted to whitewash Rep. Ilhan Omar's anti-Semitic statements regarding AIPAC and Jewish influence in U.S. Congress. She also shared a Washington Post op-ed video last May by Mehdi Hasan. The Post's own summary said he would show why the new U.S. embassy in Jerusalem was "so problematic as Israeli forces kill Palestinians in Gaza." That was a reference to violent demonstrations on the Gaza-Israel border organized by Hamas, a U.S.-designated terrorist entity. It later admitted that most of the protesters killed were Hamas members. In addition to troubling leadership, the Coalition's partners include groups which have repeatedly stood by terrorists and oppose Israel at virtually all turns. CAIR is one such partner. For example, it defended convicted terrorist Tarek Mehanna, who was sentenced to 17½ years in federal prison for conspiring to provide material support to al-Qaida and other stemming from a plot to kill American soldiers overseas. The Muslim Legal Fund of America (MLFA), another Coalition partner, boasts of its close ties to CAIR and has defended numerous Islamist terrorists and other radicals, including Palestinian Islamic Jihad governing board member Sami Al-Arian, Hamas operative Muhammad Salah, and Shain, Eljvir and Dritan Duka, brothers who to plotted kill soldiers at New Jersey's Fort Dix Army base. 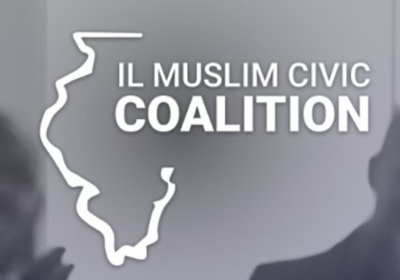 IL Muslim Civic Coalition partnered with Emgage "to increase Muslim American civic engagement, establish a clear GOTV strategy in Illinois, and publish data-driven reports to help activists and allied organizations." "Emgage and the Illinois Muslim Civic Coalition share a common goal: to ensure that Muslim Americans have a seat at the table. With this partnership, we aim to do just that by empowering and educating communities across the nation." Muhsen, still another Coalition partner, is dedicated to aiding Muslims with disabilities. That's a wholly good mission. But Muhsen was founded by the imam Omar Suleiman, who is considered an anti-Semite by the Simon Wiesenthal Center. He regularly tweets venomously anti-Israel statements, and has repeated the anti-Semitic trope that Israel has disproportionate influence in American politics. At a December 2017 rally in front of the White House to protest President Trump's announcement that he was moving the U.S. Embassy in Israel to Jerusalem, Suleiman demonstrated his contempt for the United States as well as for Israel. "We should understand that, if anything, what this announcement has done is it has exposed what we've known for a very long time – that the United States is anything but an honest broker," he said. "Never has been. Previous administrations were not. We have funded this occupation, we have emboldened this apartheid, we have shielded Israel from any consequences, facing any consequences on the international stage ... Our blind support and loyalty to a government that has disregarded all international forms of accountability because it knows that it has our backing is shameful. It has made us not only an unprincipled and contradictory nation in regards to our policies, it has also put us at odds with the vast majority of nations around the world who can see right through our claim to greatness and our claim to being the moral superpower of the world." The Coalition has also spread misinformation about sharia (Islamic law). On March 11, it retweeted a post from a staffer at the Islamist Bridge Initiative at Georgetown University: "No, Sharia law is not antithetical" to the U.S. Constitution. Here's why:" The post linked to a Bridge Initiative "factsheet" on Sharia that presents sharia law in a positive light, ignoring the elements of it that are oppressive to women, gays, and others, and claims that the negative portrayal of sharia as a "monolithic and medieval system of Islamic law" by anti-Muslim groups has "contribute[d] to Islamophobia and infringe[ment] on American Muslims' right to religious freedom." It is perfectly legal for the Coalition to form and work within the system to advance candidates and causes it likes. It's also perfectly fair for the public to be aware of the Coalition's radical partners and anti-Semitic leaders. Their "partners from diverse faiths, races, and communities" should approach any "partnership" with extreme caution.